I’m hard-pressed to find an installment in the Friday the 13th franchise that I hate. I enjoy them all, even a New Beginning and Jason Goes to Hell, for some reason or another. 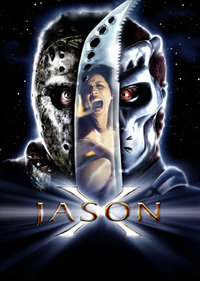 But, if I *had* to choose a Friday the 13th film to hate, well, Jason X would be my immediate response. It really is pretty terrible. In the year 2010, the Crystal Lake killer, Jason Voorhees, is imprisoned by the government. They want to dissect him and figure out how his Wolverine-like healing factor works. However, Jason breaks free and runs amok all over the prison facility until he is eventually cryogenically frozen in a pod and left forgotten. Hundreds of years later, a research vessel called the Grendal travels to the ruins of Earth on a scientific expedition. They discover Jason’s frozen corpse, bring him on board and thaw him out. Bad move. Jason picks up where he left off, killing the worthless teenagers and eventually getting an upgrade into the all-powerful “Jason X”. The first half of Jason X isn’t so bad. I enjoy seeing “traditional Jason” running around the Grendal, killing off those stupid kids. Indeed, this film has a number of fantastic kills in it, as well. My favorites would have to be the liquid nitrogen face-smash, the impalement on the giant drill bit, and the double sleeping bag-kill (an homage to Part VII). Kane Hodder also delivers one of his best performances as Jason (yeah, you heard that right). The first half of the movie is quite tolerable. Then the leather-clad ninja cyborg shows up and the whole thing goes to s***. The movie has a very tongue-in-cheek atmosphere, I know, but this was just stupid. Jason X (called Uber Jason by fans) also isn’t a very good design, as he looks a bit too much like Mecha Kong from “King Kong Escapes”. I’m also not fond of this being, chronologically, the last appearance of Jason; cementing his fate. Having his body frozen in the “distant” future of 2010 doesn’t leave much room for sequels, either. And then there’s the whole concept of “Jason in Space” that just doesn’t sit right with many. They did it with Leprechaun, they did it with Critters, they did it with Hellraiser, and now Friday the 13th is next to fall victim to this ridiculous trend born from utter creative bankruptcy. Of all the Friday the 13th films made to this point (11 if you count Freddy vs. Jason), this is without a doubt my least favorite and certainly the least essential. I can only hope that one day they just ignore the existence of this film and continue making sequels past the year 2010.